The region of Bansko undoubtedly has a wide variety of places – some well-known, others not so much, as all of these places offer something to every tourist. 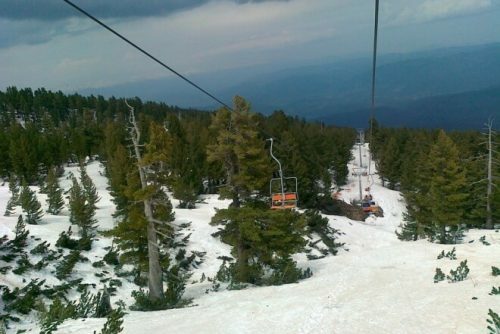 If you are adventurous and you love the fresh mountain air and winter walks in nature, then the chairlift Dobrinishte will provide you with such an adventure. Here you can enjoy the crystal clear air of the resort while looking at the magnificent moutainous views. Dobrinishte is an important point from which start the tourist routes in Pirin Mountain. A well- maintained asphalt road connects Dobrinishte with “Gotse Delchev“ hut (1485m above sea level), and from there with the chairlift you can get to the beautiful hut “Bezbog” (2227m above seal level), which facilitates the climbing in the alpine part of the mountain. Chairlift Dobrinishte, which is also called “veteran”, is maintained in excellent condition and functions all year round without any breaks. The lower station of the lift is located at 1485m above sea level, “Gotse Delchev” hut, the medium station is located at 1894m above sea level, and the upper station of the lift is at 2227m above sea level, “Bezbog” hut. The route of the first section is 1514m long, the second is 1731m long, or total length of 3245m. You can overcome the displacement of 742m for about 27 minutes. The capacity of the facility is 500 people per hour. The working time of the lift is from Monday to Sunday: 08:30-16:30h. Dobrinishte is a balneological and winter resort in Southwestern Bulgaria. 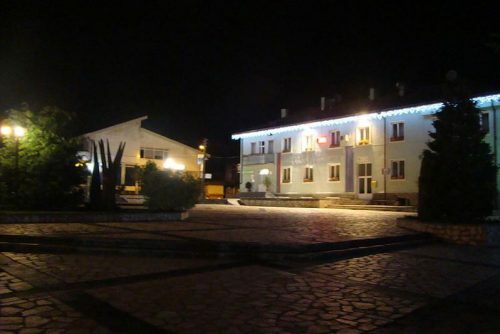 It is located in Bansko municipality, Blagoevgrad region. Its population is 2803 people. It is situated in a mountainous region, at 850 m above sea level and is surrounded by three mountains – Rila, Pririn and Rhodopes. 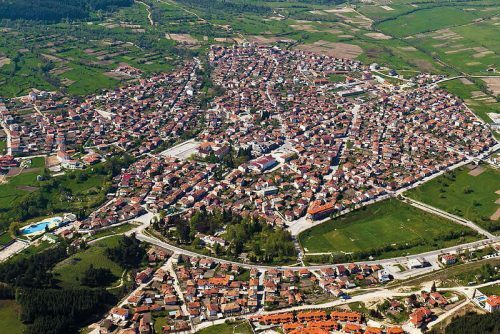 Dobrinishte is located at a distance of 6 km to the west from Bansko, and at a distance of 40 km to the south from Gotse Delchev. Disilitsa (Dobrinishka River) passes along Dobrinishte. Dobrinishte is the final railway station of the unique narrow-gauge line, which is the only one functioning in Bulgaria, as it connects Dobrinishte with Septemvri through Bansko, Razlog, Velingrad and Yakoruda. The town is a natural starting point of many routes of Pirin Mountain. „Gotse Delchev“ hut (1412 m) is located at a distance of 11 km from Dobrinishte, and from there starts the chairlift to “Bezbog hut” (2236 m). The tourist routes takes us to Tevno Lake, Popovoto Lake and to mount Bezbog. The route from „Bezbog“hut to the town of Melnik lasts about 12 hours, and there is a constructed ski run from „Bezbog” hut to “Gotse Delchev” hut. In Pirin Mountain we can also see the functioning monastery “Saint Panteleimon”, which is located 4 km northwest from the Obidim village and about 3 km southeast from Dobrinishte. The monastery was founded in 1920s. It is a complex that includes a church, residential and farming area, and this building is declared a monument of culture. This small town is a good place to start or finish mountain hikes. It is located at the foot of Pirin Mountain and it is also known as a balneological center. The mineral waters in the region are famous for their healing properties and they are a real elixir for the body, because they help for the restoration of the the muscle tone after long physical exercise. The name of the settlement was Dobrinishta until January 4, 1966. During the times of the Bulgarian Revival period, the Bulgarian population in Dobrinishte started growing again. People living in the mountainous neighborhoods gradually returned to the village. At the end of XVIII and the beginning of XIX century, Dobrinishte expanded and experienced an economic growth, so it carried out successful trade with countries such as Serbia, Austria, France, Spain and others. An interesting fact about Dobrinishte is that in its central northern part there are remains of an early Neolithic settlement with an area of about 7 decares, at a distance of 150 m from the right bank of Vallyavitsa River, near the mineral spring. After the excavations were found foundations of buildings, tools of labor, ceramics and anthropomorphic figures. These finds date back to the first half of 6th millennium B.C., i.e. from the second half or the end of the early Neolithic period in the Central Balkan zone. From a cultural point of view, the Neolithic settlement in Dobrinishte belongs to the southwestern version of Karanovo I culture, which is represented also in the settlements in Rakitovo, Eleshnitsa, Kovatchevo and Belitsa. Due to its mineral waters and the favorable geographic location, Dobrinishte offers excellent conditions for living many years before the Thracians appeared on these lands. Thracian and Roman cermaics have been found in the settlement and in the region that surrounds Dobrinishte. In the Domatarsko area are visible the ruins of a Thracian settlement. Moreover, in the Gumnishta area, where there was an ancient settlement, were found coins from the Roman emperor Nero (I century). According to legends and songs from VII – XVI century, Dobrinishte was a settlement –fortress. Its role was to stop the attempts of the Byzantine emperors to pass through Mesta River to the central parts of Bulgaria. In 1846 during the Ottoman Rule, the residents built a school, they organized revolutionary groups and took an active part in the national liberation struggles of the Bulgarian nation. Near the river, which passes through Dobrinishte, there are mineral springs, and the old pools are found exactly in this place. The construction of two of them is Roman, as the base and the upper part is Turkish.